Royal Jelly: The Olivia Tremor Control - California Demise 7"
The Olivia Tremor Control - California Demise 7"
You can't talk about Psychedelic Pop without bringing up The Olivia Tremor Control. This band is what The Beatles would've sounded like if they continued on the musical path they started with Revolver. California Demise is a great starting point to listen to The Olivia Tremor control because it's the shortest and most controlled of their recordings, however that doesn't take away from the fact that this is a mind blowing 7". 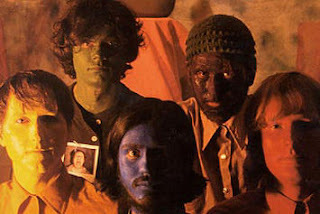 Featuring OTC in it's initial line up with, now indie rock legend, Jeff Mangum on the drums (he started out as a drummer before picking up the guitar). You can see that, even in this immature state, they were starting to experiment with drone/sound collage recordings in "California Demise pt. 1" and "California Demise pt. 2". "Fireplace" is a highlight for those Jeff Mangum fans out there as it features Jeff on vocals (gasp! it's like a new NMH song!). The Barreracudas - New York Honeys 7"